In good tradition, though I have seen the first titles of this series around, I never got to read them – and I soundly and thoroughly regretted that as soon as I began reading this baby right here. Not because I felt like I wouldn’t be able to keep up with the story because of missing bits of information, but because it was such an entertaining read. The world of this novel was, in one word, fabulous. 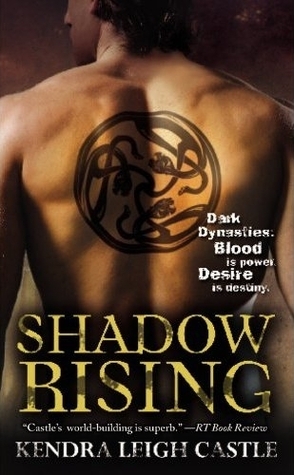 I couldn’t have asked for more, really, vampires, shifters, dynasties and conflict – all around fabulousness. Of course, we’re talking vampires and shifters, pretty much traditional PNR beings, but they do come with a twist. In fact, more of a twist then I would have though, you’ll end up discovering that some vampires are something you wouldn’t have expected. So in this world, the element of surprise may not be exactly the building blocks, but the way they combine and the result they bring. As a personal note, the subtle angel angle that pops out in the story isn’t a big plus, as you guys know I’m not big on any angel associations in these stories. This is probably what turned my excitement down a notch, somewhere closer to the end of story. They were pretty solidly built, it was clear where they were coming from, what motivated them, what their drive was. Damien was very charismatic, he had that bad boy charm but also an inherent goodness, somehow, you know what I mean? He’s exactly the kind of mix you’re gonna enjoy, all crunchy on the outside with juicy filling 😀 He’s a very conflicted guy, and I’m a sucker for that every time. Ariane was perhaps less charismatic but very endearing. As the story unfolded she evolved, she matured to some extent though she was old enough to begin with. But leading a sheltered life, she starts off almost as a kid, a teenager with mad fighting skills maybe. Their chemistry was interesting, it was the simmering slow burn sort of thing rather then actually explosive. I generally tend to like the slow burn type better, it makes more sense with the characters and it feels more real to me, more love story then affair, you know? So this read like a love story, big plus for me. The plot was really active without becoming overwhelming for me. I was interested in what was going on and the romance angle was woven in beautifully, it didn’t stand out to outshine the events but it didn’t go on the back-burner either. The story outside of the romance was really interesting, I would have wanted to see what was what even without the romance going on. The writing was really good, I loved it. It was unpretentious and straight forward, but at the same time the imagery was very suggestive. The part I liked the most probably would be the feeling, characters came through beautifully because of their feelings and it was really easy to relate. Fighting scenes were really well written too, I liked the focus on elements. And most of all, I loved the sense of humor. It wasn’t an overall funny story, but when the characters had a good sense of humor and as always I loved that. As far as curb appeal goes, the cover is pretty standard. I wouldn’t say it was what sold me the read, though the tattoo intrigued me somewhat since it’s not the regular tribal, so it made me think it has some special meaning – and it did. I loved that after I got its meaning. Without the book blurb, I probably wouldn’t have gone for it, but I wouldn’t have dismissed it just on the cover either. It’s one of those standard ones I guess, it didn’t really pop out on itself. As a personal note, I felt previous covers of the books in the series were more attractive, especially book #1 for instance. But maybe that’s just me. Overall, this was a good read. It was fun, entertaining, interesting, it kept me curious all the way and the romance was well paced. If you like PNR, give it a try even if you didn’t read the other books in the series, I didn’t and I had a great time reading this one. Cat shifters: hot or not? Whaddaya guys think?